It’s already the sixth of December and Christmas is just around the corner. Right now, you must be busy shopping for Christmas gifts. If you are looking for tech gadgets for your kids, this may help you. 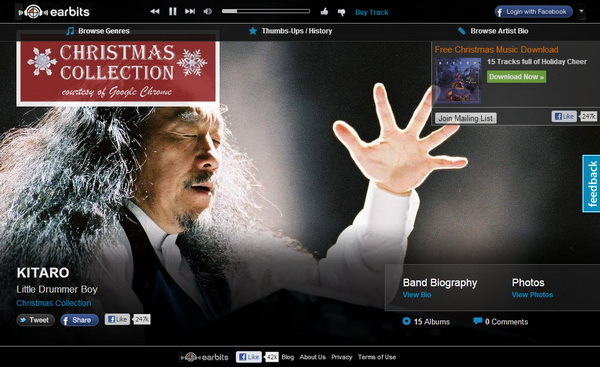 At the meantime, let’s set up the holiday mood by listening to some good Christmas songs. For starters, you can head over to Earbits streaming online radio and listen to a selection of 15 nice Christmas music from independent artists. Besides listen to the music online, thanks to the partnership between Earbits and Google Chrome, you can download a whole collection of Christmas songs for free. The download file is about 112 MB in size and contains a total of 15 Christmas songs, all in MP3 format. To download, hop over to this page and hit the download button at the top right of the screen. Yes, enjoy the music.